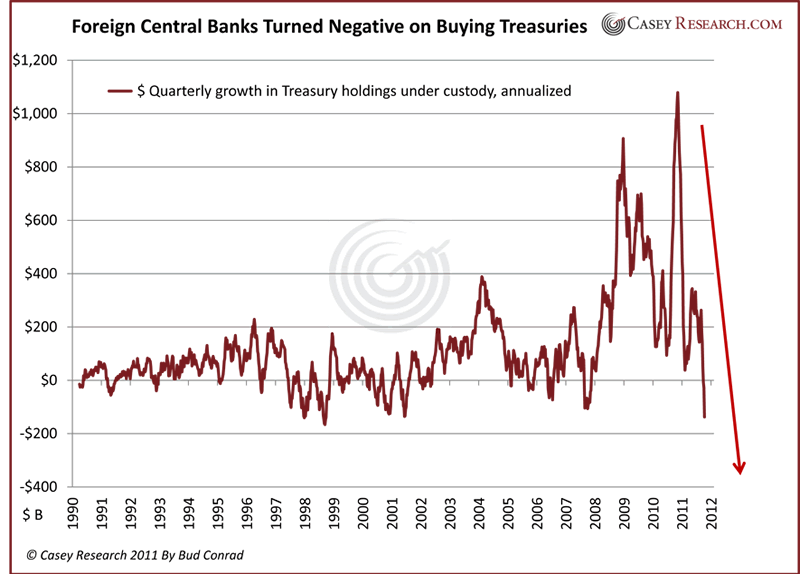 Bud Conrad, Casey Research writes: Foreign central banks buy US Treasury and Agency debt through accounts at the Federal Reserve, where it is held in custody. Without these central banks buying our debt, the US federal government would have to find a new source of funds or the result could be higher interest rates. Looking at the data on a monthly basis (and then multiplied by 12 to give the annual rate), here is the dramatic picture of how foreign central-bank purchases of our debt have shifted, from buying $500 billion to selling off $1 trillion. At this rate of selling over several months, interest rates would go higher – if other things were equal. Of course, things are not equal because the Fed has been forcing rates lower with its massive QE2 and other programs. QE2 was $600 billion over nine months, or an annualized rate of $800 billion per year. Since foreigners are selling off our government debt, Fed purchases of government debt are even more necessary. Here are the data on the amount of Treasuries purchased in the last quarter of the year at an annualized rate: Foreigners have decreased their holdings for the first time since 2007. Here's another chart worth considering. 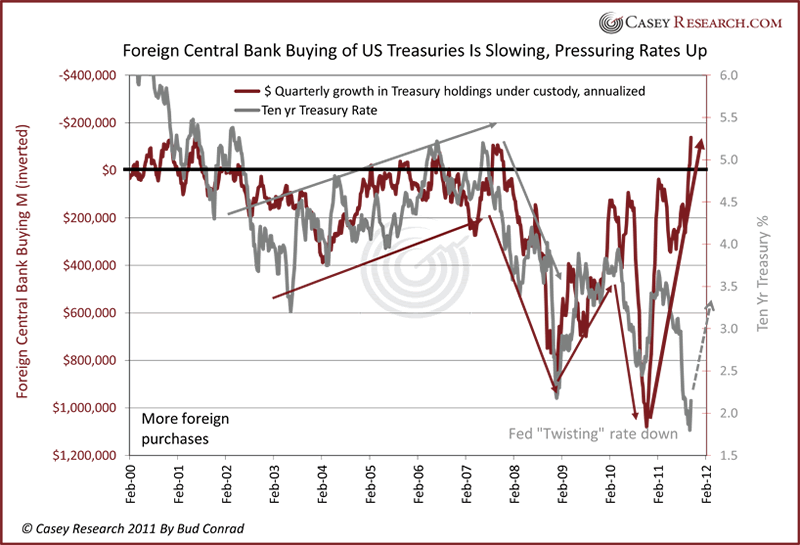 This is a comparison to the ten-year Treasury, with the purchases of Treasuries inverted. In my latest article in The Casey Report on interest rates, I discuss the above chart and cover the broader issues driving interest rates. What could be the cause of all this? The Senate passed a controversial bill that threatens to punish China for "currency manipulation" which will bring mandatory tariffs. China's opposition to the Senate action could be the power behind the big shift in direction of these custody holdings. In an election year, government action against Chinese imports may be seen as supportive for US jobs, thus garnering votes. But unintended consequences of decreasing liquidity in the credit markets will put pressure on financial markets. The movement shown in these charts could be the result of China's reaction to some of those anticipated policies. We can't tell what country is doing the selling until two months have gone by and the TIC data are published. In some senses, it doesn't matter which country is behind the shift. If rates begin to rise rapidly, even in the face of continued Fed manipulation, it could call into question confidence in the Fed's ability to keep supporting the economy. The rate on the ten-year Treasuries jumped from 1.8% to 2.2% in the last week. 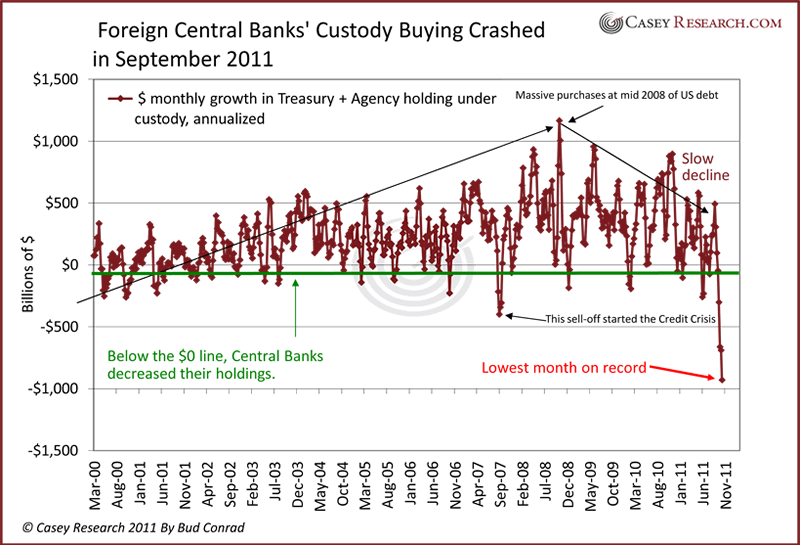 Foreign selling of this magnitude is dangerous for the dollar, and it could be very bad for US interest rates.